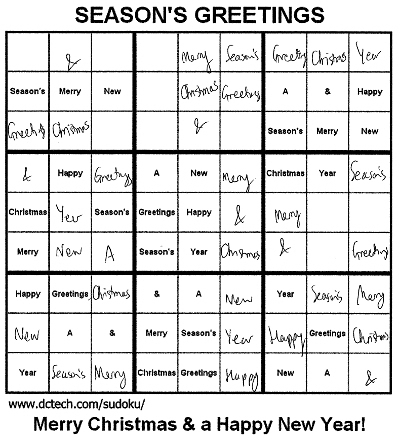 Sudoku with Christmas symbols instead of numbers. Some kids ones here and here. Not a bad intro to sudoku for kids who aren't already familiar with it, but way too easy for those who are. This one's a bit bigger and uses the words from "Merry Christmas and a Happy New Year" and "Seasons Greetings". Your handwriting sure deteriorates writing whole words. But it's very achievable for a learner too. 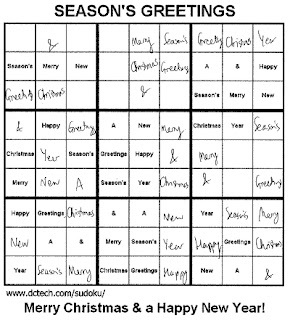 To teach kids the ideas of Sudoku, I also found this Christmas Sudoku to play online that takes you through filling in the gaps with increasing difficulty. It's a very short run through, but you could discuss it as a class as a starting point.